Gel Pac® is a ‘Gel’ delivery system for use in day old poultry that may be used as a vehicle for delivering a range of products such as vaccines, competitive exclusion and nutritional supplements. Gel Pac® greatly improves uptake of product by birds compared with standard methods of product delivery in the hatchery which utilise water as the vehicle. Traditional water spray application can results in the chilling of chicks but the use of Gel Pac® to apply products avoids this problem. Gel Pac® also stabilizes the water used for reconstitution of the ‘gel’ and guards against the threats caused by oxidizers, inappropriate pH, and, in some cases, poor mineral balance. 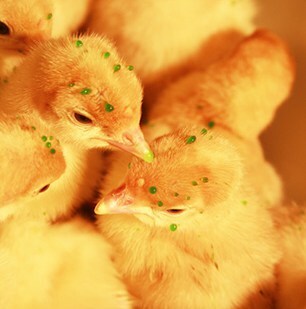 Although referred to as a ‘gel’, Gel Pac® behaves in a very similar manner to water in terms of but has differing viscosity, and it is administered via special nozzles which deposit distinct ‘beads of gel’ on the feathers of the day old chicks. These beads are very attractive to other birds in the chick box and so the product is consumed by the birds pecking it off one another.